Meet our advisory board of top doctors who will help test, curate and educate on your beauty regimen. 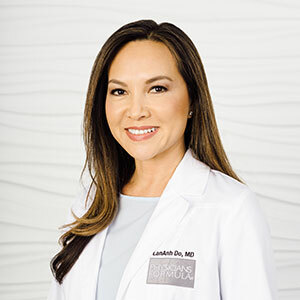 Board-Certified in Allergy and Immunology, Internal Medicine and Pediatrics and specializing in the treatment of asthma, allergies and immune disorders, Dr. LanAnh Do-Tarnay graduated from UCLA and obtained a medical degree with honors from the UCLA David Geffen School of Medicine. While practicing in the field, Dr. LanAnh Do-Tarnay was compelled to pursue her passion and specialty – of Allergy. She completed her fellowship training in Allergy and Immunology at Harbor-UCLA and UCLA Medical Center. Dr. LanAnh Do-Tarnay currently serves on the Board of Directors of the California Society of Allergy Asthma and Immunology. She has also been included in the “Best Doctors in America” List, the “Los Angeles Super Doctors” List, Castle Connolly Top Doctor List, and “Leading Physicians in the World” List. I love that the serum gives both instant and long-term desired effects. I like to use it day and night to give my skin the hydration that I believe is the foundation to skincare. Upon application, the feel is soothing and silky on the skin and leaves an instant glow. With regular use I find my skin tone to be more even. Dr. Rachael Cayce is a Board-Certified Dermatologist specializing in the treatment of complex medical and cosmetic dermatology. She is also a Fellow of the American Academy of Dermatology. Earning her medical degree from the University of Texas (UT) Southwestern Medical School, where she graduated at the top of her class, Dr. Cayce was selected for the prestigious Doris Duke Clinical Research Fellowship focused on advanced medical Dermatology. She completed her internship and residency at UT Southwestern and during her residency was selected to serve as Chief Resident. I use the Rose Gold and the Pink Butter Highlighter everyday as my eyeshadow and lip color. They are easy to apply without having to rub my eyes or use harsh makeup bristles and are easy to remove without harsh makeup remover. This is great for my very sensitive skin. 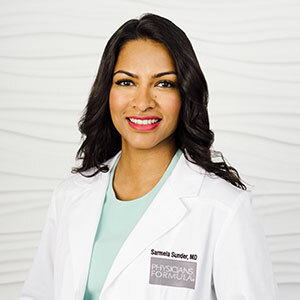 Dr. Sarmela Sunder is a double Board-Certified Head & Neck Surgeon and Facial Plastic and Reconstructive Surgeon specializing in the face and neck areas. Trained at the Johns Hopkins University, she received dual degrees in Public Health and Anthropology, graduating Phi Beta Kappa and with honors. She continued her medical education at Cornell Medical College, followed by a residency program at Stanford University where she completed her internship in General Surgery and residency in Otolaryngology-Head & Neck Surgery. She was then accepted to a prestigious fellowship accredited by the American Board of Facial Plastic and Reconstructive Surgery. I love that it goes on so creamy and dries with a satin matte finish. It is not drying like other matte colors so my lips still feel moist and healthy hours later. I love to pair it with the Organic Wear Lip Treatment underneath to keep my lips looking and feeling hydrated and fresh!